Home Shayne Ward is an X Factor winner from England. Shayne released his second album in November 2007 with songs mainly written by Rami, Arnthor Birgisson and Savan Kotecha. Alexandra 4 January 2007: Niklas emailed and said he read in a Swedish magazine that Rami has been working with X Factor winner Shayne Ward from England and has written 4 songs which are coming out in 2007. News 2007, 2006 Written by Arnthor Birgisson, Savan Kotecha and Max Martin. 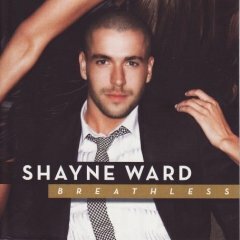 Breathless is Shayne's second album and as you can see Rami, Arnthor and Savan wrote most of it. It is a fantastic pop album - well done. My favourite songs are Damaged, If That's Ok With You, No U Hang Up and Tangled Up. 26 Cher Lloyd 1. No U Hang Up Rami/A.Birgisson/Savan Kotecha. Produced by Rami and Arnthor for Maratone Productions. 27 Christina Aguilera 2. Breathless Rami/A.Birgisson/Savan Kotecha. Produced by Rami and Arnthor for Maratone Productions. 28 Cyndi Lauper 3. If That's OK With You A.Birgisson/Savan Kotecha/Max Martin. Produced by Arnthor for Maratone Productions. 29 Darin 4. Damaged Rami/A.Birgisson/Savan Kotecha. Produced by Rami and Arnthor for Maratone Productions. 31 Dede 6. Until You Rami/A.Birgisson/Savan Kotecha. Produced by Rami and Arnthor for Maratone Productions. 32 Def Leppard 7. Some Tears Never Dry Rami/A.Birgisson/Savan Kotecha. Produced by Rami and Arnthor for Maratone Productions. 35 E-Type 10. Just Be Good To Me Harris/Lewis. Produced by Brian Rawling and Paul Meehan. 36 Emblem3 11. U Got Me So Rami/A.Birgisson/Savan Kotecha. Produced by Rami and Arnthor for Maratone Productions. 37 Enrique Iglesias 12. You Make Me Wish Rami/A.Birgisson/Savan Kotecha. Produced by Rami and Arnthor for Maratone Productions. 44 Human Nature Evan Rogers and Carl Sturken also wrote the NSync hit 'God Must Have Spent a Little More Time On You' and the Kelly Clarkson hit 'The Trouble With Love Is' as well as songs for Boyzone and Christina Aguilera. 46 James Blunt Interestingly Rogers and Sturken started their own record label SRP Records in 2005 and their first signing was Rihanna and they co-wrote her songs 'Pon de Replay' and 'Umbrella'. 50 Kahsay Yes, the song Just Be Good To Me is a cover song.